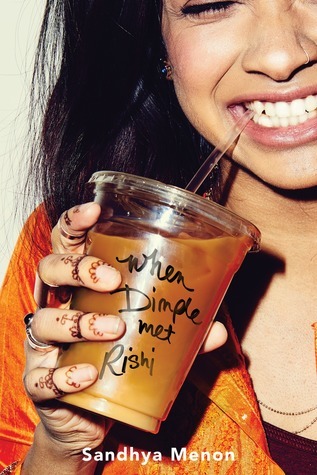 The first thing that drew me to When Dimple Met Rishi by Sandhya Menon was the gorgeous cover!! Admittedly, I cannot resist a book with an awesome cover, and this one just looked like it would be so much fun to read. And I had heard nothing but great things about the book, so I couldn’t wait to get started on it. I’m really glad I read the book, it was Such a good read! Reading the book, you can’t help but love the two main characters, Dimple and Rishi, and you get to read the story from their alternate viewpoints. Both were really awesome characters. I love that Dimple was so determined; she knew exactly what she wanted for her future and was completely set on getting it. I also love that Rishi was head-over-heels in love with her. Their relationship may have gotten off to a rocky start, but it was SO CUTE to watch it grow over the course of the book, and it made for the best story. They both have really great family members, who made for some interesting secondary characters in the story as well! Both the storyline and the setting for the book were really great as well. I’m not sure if InsomniaCon is a real thing, but it sounds like lots of fun. And I totally want to visit California now, and go to all of the places that Rishi and Dimple went to. It was all so interesting, and I was completely fascinated by everything. I really love when that happens! Overall; I really, REALLY enjoyed When Dimple Met Rishi!! I’m definitely adding Sandhya Menon to my list of authors to watch for, and I’m really excited to read more by her in the future! Do check out this book when you can, and I hope you enjoy it just as much as I did! I agree - this one has SUCH a cute cover! Great review!! I've been seeing this book everywhere and I just NEED to get my hands on it lol. Dimple and Rishi both sound like really interesting characters, and it seems like I'm really gonna root for their relationship. I also love when books make me want to go to where they take place. This book just sounds wonderful!! Great review! The cover is what grabbed me in initially too! I love the plot of this, and I hope I get to it soon! It sounds like a perfect mix of light-hearted while still having important messages.